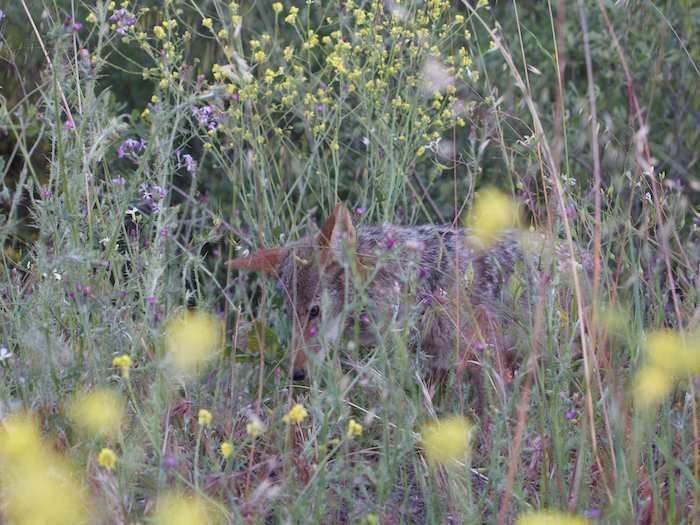 A few days ago, I was able to keep up with one of the coyotes I know as she began trekked at dusk. She started out in a park where she found a gopher as she lingered, waiting for the day to fade. 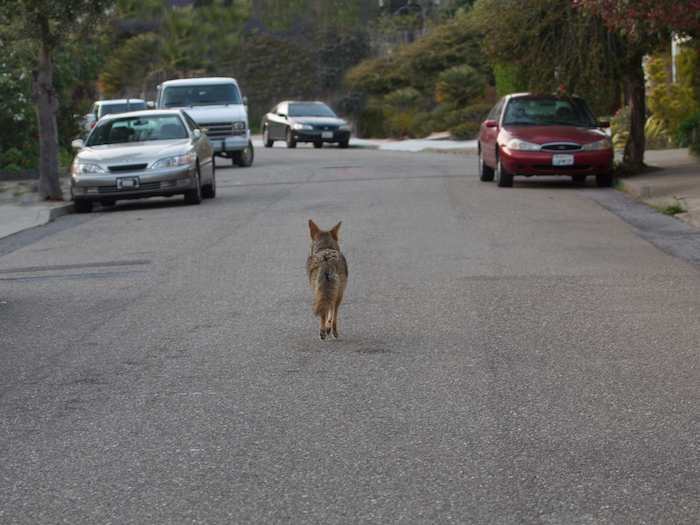 Then she headed out into a neighborhood street, with plenty of parked cars but no moving traffic. She picked up a couple of mice at the edges of driveways. She didn’t have to search for them — they were just “there”. She couldn’t have seen them. Did she hear them or smell them? They were small and eaten quickly. She then headed, decisively, to wherever she was going. She walked at a fast pace and kept her body high and tall — she was on high alert. She was amazingly tuned-in to her surroundings and the human world she entered as twilight set in. I’ve been told that pet dogs know their owners better than the owners know themselves. This is because they watch you all day! 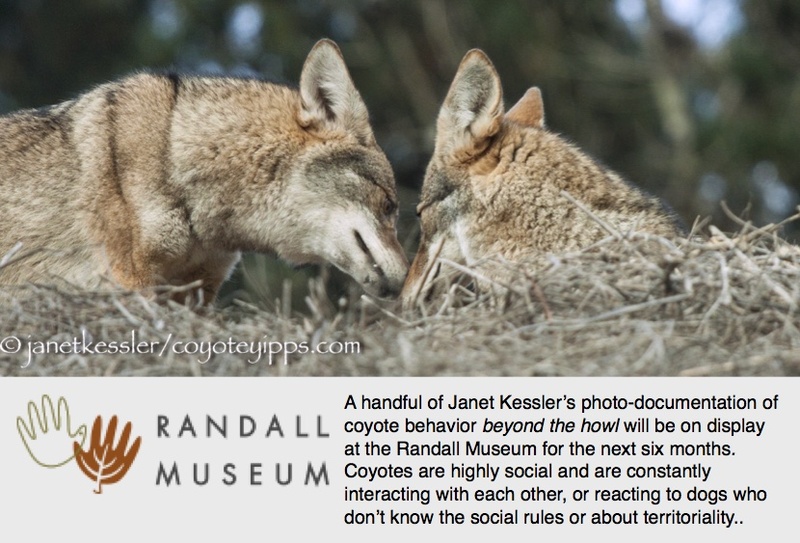 Well, coyotes don’t watch you all day, but they do watch us — from behind the scenes — and they learn our patterns. She seemed to know where human perception lay, and that it wasn’t as keen as hers, especially at night. She knew when to stand still, when to duck down or simply walk behind a tree so that only part of her was visible — not enough to make her recognizable. 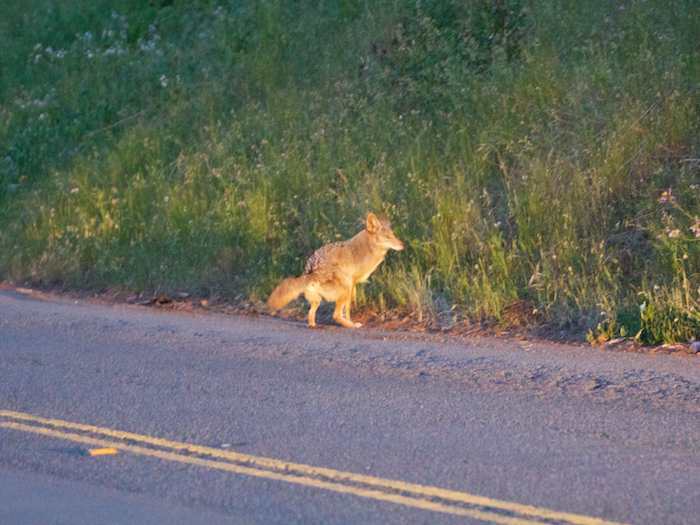 Only one person saw her — amazed — “is that a coyote!” She stuck to the side of the road where she could duck into high grasses or shrubbery if she needed to — and she needed to three times, when three different cars went by. 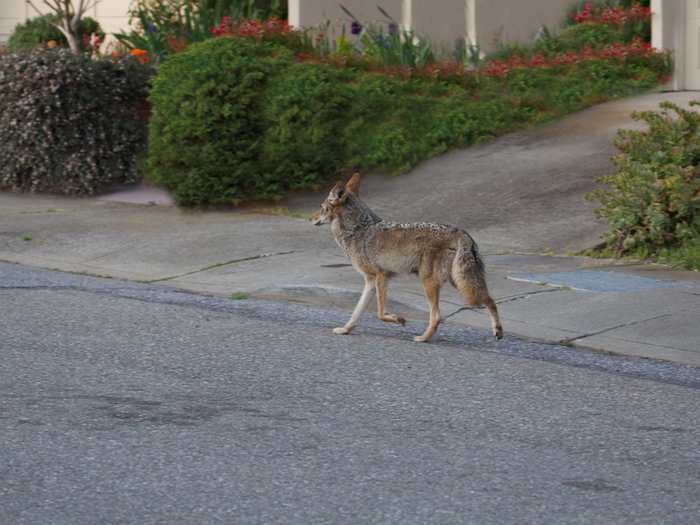 But she also wandered into the middle of the road several times, zigzagging right down the middle of it. Her next stop was way down the street at an abandoned field where she hunted and caught another gopher. It took her only a short time to eat this, crushing the bones so the gopher could be consumed whole. Then she trotted assuredly onto a long church driveway. She seemed to know where she was headed. 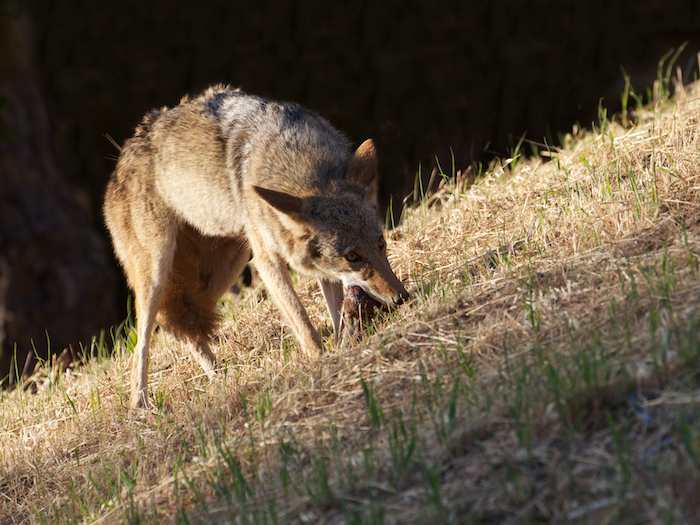 She moved along the driveway fairly quickly, stopping to sniff and “mark” in a couple of places, before climbing a hill at the edge of the church property. Here she hunted a little, but didn’t find anything. She was now at the edge of a 6-lane thoroughfare. I thought she would turn back and descend the hill — but she waited there as the traffic whizzed by — she was hidden by the fading daylight and the darkness under dense trees. Then she took off — resolutely — across the street! “Oh, no,” I thought, “I’m going to have to watch her die”. But, as she crossed, the traffic magically parted for her. In fact, I was able to cross during the same brief break in the traffic. Her judgement and timing were excellent. 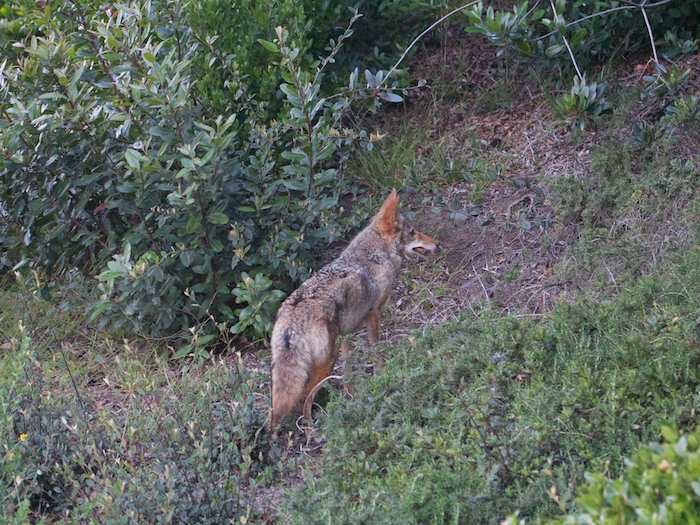 She got to the other side of the street and climbed the steep grassy embankment and was off down the next winding two-lane road. Please note that it’s much darker than the photos show — the headlights of the cars are on because they need them. I exerted myself to keep up but lagged behind because of the steep hill. When I got to the road she was now on, she was way way ahead — almost invisible in the dusk. I decided to give catching-up a try. I was able to do so because she stopped to examine and pick up some road kill — I think it was part of a squirrel. She carried it off to the side of the road where she was somewhat hidden in the tall grasses. This is when I caught my breath. She spent several minutes eating her find. She then descended from her hiding place and continued on her way, up the two lane road. Her trajectory as I followed was in a single direction — far and away from where she began. I wondered where she was ultimately headed. 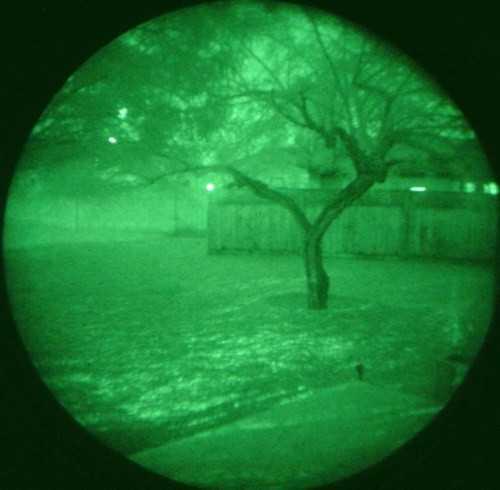 I would have needed night vision goggles to follow any further. I actually tried on a pair of night vision goggles from my son’s lab. Wow! In a totally blackened room, you can SEE! What you see is a very clear and sharp black and green. 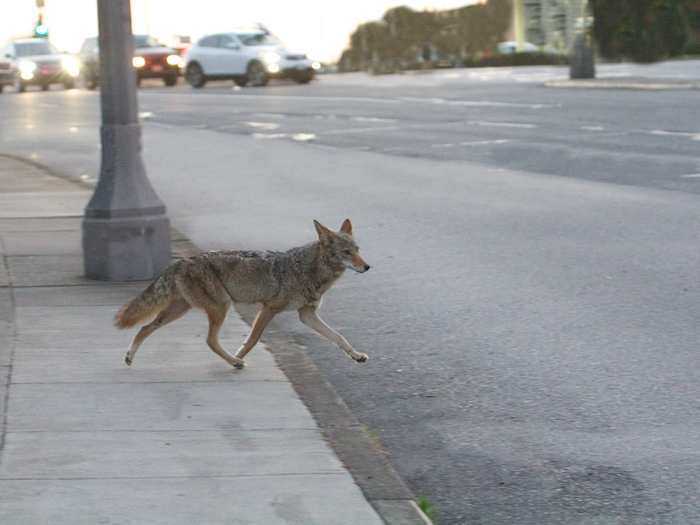 I wondered how close these are to coyote night vision. Most of the daytime treks I’ve kept up with lasted anywhere from one to three hours. I’ve always assumed that nighttime trekking was a more substantial endeavor, maybe lasting all night. I wasn’t able to find out how long this one lasted because of my own inability to see. I turned around and went back.